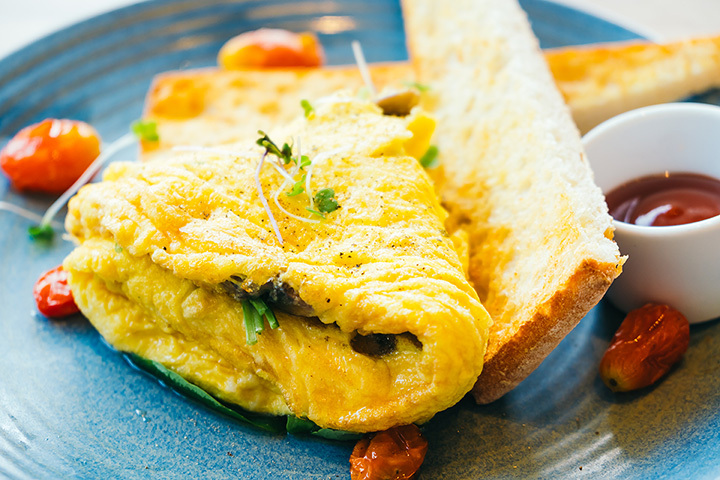 With its combination of eggs, cheese, meat, and veggies, omelets are the perfect way to start the day and keep you moving through it. In Michigan, you’ll find plenty of breakfast spots—and even lunch—serving up some of the best omelets around. So no matter when you’re craving it, you’ll find something delicious at these 10 great spots in the state. Gest Omelettes in Redford is a great place to hit for breakfast or for lunch, as it will have plenty of items on hand for each. The clear winner here, though, is the omelets, as they've got 14 such dishes on hand. Ranging from versions with crepes to versions without, with meat or without, and even an entire slate of choices for those who'd rather assemble their own perfect omelet. For omelets, this is one of the greats. With 13 different omelet options including the Reuben—yes, like the sandwich—and the Club, also like the sandwich, there's a lot to choose from. The king of them all, though, is the Three Oinker, featuring ham, bacon, and actual shredded pork. Naturally, it's not just omelets here, but those who want the classic egg dish will find everything they could ask for and then some. Grand Rapids is home to this noteworthy omelet stop, the Real Food Cafe. It's not particularly noteworthy in its appearance, but rather in offering. There are nine different omelets here, and the 10th one goes to “plain omelet” followed by those great words “build your own favorite by adding:” Yes, it's a complete build-your-own affair, including six different meats, eight different cheeses—including fresh mozzarella—and an array of veggies. There's even an option to stuff your omelet full of home fries, giving you the ability to build a loaded baked potato omelet. For Nick's Original Pancake House in Ann Arbor, omelets run a close second in terms of importance (after pancakes, of course!). One major draw here is the Big Fella Omelette, which boasts four eggs, three different kind of pork, sweet onion and cheddar cheese. Top it off with sour cream and throw in an array of sides and that's one impressive breakfast. Throw in eight other kinds of omelet and a build-your-own option to round it out, and Nick's will make one killer destination. Angelo's Coney Island in Flint managed to pull off quite a coup, being elected the best place in Genesee County to get an omelet by viewers of area CBS affiliate WNEM. Indeed, Angelo's—commonly known for its hot dogs—did boast an array of impressive omelets and at surprising prices. Featuring seven different kinds all for under $8—and only the Farmer's Omelette described as “extra extra large” weighed in at that price—this hot dog haven is actually packing an excellent omelet range. Tony's Restaurant in Saginaw pulled off a similar coup to Angelo's, being elected best place for an omelet in the Tri-Cities—Saginaw, Midland and Bay City—by WNEM viewership. After checking their Facebook page and finding that omelet was indeed a trending term on the page, it was clear that Tony's knew its omelets in the Tri-Cities area quite well. With both a steak and cheese and an Italian sausage and cheese on the menu, it's hard not to back this place. Offering up the Omelette Shoppe, an actual omelet specialty joint, we knew there were great things afoot here. Featuring eight kinds of omelets from the simple Farmers and Western omelets to the bizarre New Mexican—featuring beef barbacoa, black beans, green chiles, jalapenos, onions, and two cheeses—it was clear the Omelette Shoppe would have the waterfront covered here in grand style. A Dimondale staple since 1968, reports note, Mike's Village Restaurant might well be the epitome of small town cuisine. Here, the omelets may be few in number, but they're substantial, and part of a heartier overall breakfast scheme. Sometimes the specialty items are the ones done best, and Mike's Village Restaurant won't fail to disappoint. It's not surprising that the Upper Peninsula likes its omelets too, and Marquette staple Jeffrey's Restaurant delivers on that front well. Not only is it home to what one TripAdvisor patron called “the biggest omelette ever,” but also to the “Best Breakfast in Marquette” title four years running. Nine different omelets call this place home, and each one is a three-egg omelet that boasts your choice of hash browns or American fries, as well as one of several different breeds of toast. Don't forget about Detroit when it comes to omelets, because they've got a doozy waiting at the Hudson Cafe. While there are some standards here, like the Triple Triple—three kinds of meat and three kinds of cheese—there are also unusual choices like the Seafood omelet, boasting fresh crab meat and shrimp. The Thanksgiving omelet, meanwhile, boasts turkey in sausage form, along with spinach, cranberries, and Swiss cheese.